We invite you to preview highlights from the second special Centennial Issue of the Catholic Historical Review. On this page you can browse summaries of articles appearing in the Catholic Historical Review. analyses of major instruments of research such as encyclopedias, descriptions of shifts in historical method, assessments of the impact upon historians of events like the First and the Second Vatican Councils, and discussions of the vocation of Catholic historians of the Church. Since The Catholic Historical Review, founded to focus on North American Catholic history, has published few articles on early Christianity, this essay focuses mainly on the book reviews published. Since 1915, there have been major shifts in the historiography of late antiquity and late-ancient Christianity. More recent interest in social and cultural history has strongly influenced the creation of new areas of scholarship. recognized its Christian features. Polemics were generally avoided in the treatment of the Reformation. The life and thought of Martin Luther drew more attention than did any other individual. Events in England generally predominated. The CHR devoted more space to the Catholic Reform than to the Renaissance or the Reformation. Here two issues stood out: the name to be given to the Catholicism of the period, and the degree of continuity between medieval Catholicism in England and the Catholicism that emerged after the arrival of the missionaries in 1580. The CHR has always paid attention to modern European history in its pages. But the meaning of what modern European history entailed varied over its history. At the beginning the journal presented Catholic research on the different origins of American Catholic cultures. In the central decades of the twentieth century, the focus shifted to Europe as a bona fide research subject that had significance for American history. A later tendency offers evidence for the American effort to be a leader and active partner in the main debates about a global historiography. 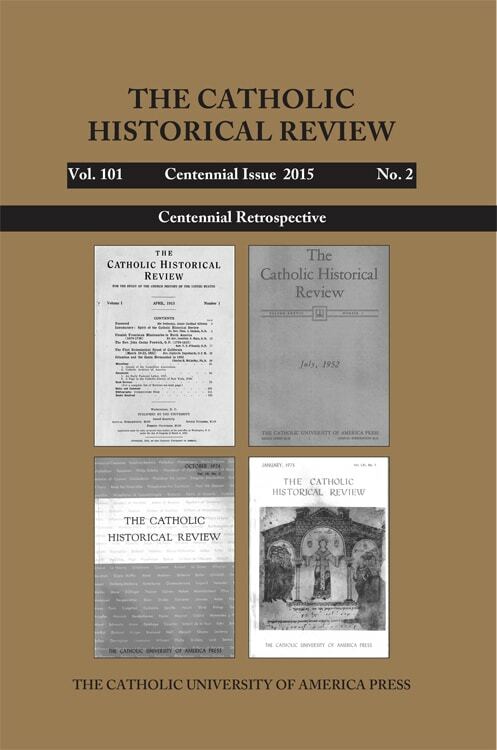 The author analyzes the 125 articles published in The Catholic Historical Review between 1915 and the centennial. The first part contextualizes the individual contributions against landmark scholarship in the field of Catholic missions to colonial Latin America and Ming China. The second part presents statistical analyses of the articles by subfields and decades, showing the preponderance of publications in Latin America (48 percent), North America (30 percent), and Asia (12 percent). It concludes with a succinct comparison of the profile of this journal in the field of missions history against other scholarly venues. The Catholic Historical Review initially focused on Catholic Church history in the United States, but the purpose soon expanded to the “larger domain of church history, both national and universal.” This examination of the journal since its first issue highlights the treatment of mission history and sketches the relationship between missions and world Christianity.